Born February 3, 1898 in Memphis, Tennessee, Lillian Hardin Armstrong came to the music scene when only men played music professionally. As a young girl she studied music, but when she heard jazz, that was it. She was hooked. It seemed the music was so deep inside her, Lil couldn’t help but let it all come out whenever she played the piano. Growing up near Beale Street in Memphis, Mister W. C. Handy, the Father of Blues, would march his band right down the middle of the street. Lil longed to go listen, but her mother said, “Oh, no.” “Devil music.” She kept Lil far away. When her family moved North, part of the Great Migration, they ended up in Chicago. There, she would meet Jelly Roll Morton and other Jazz greats. While working as the piano player for the New Orleans Creole Jazz Band, she met a fellow from New Orleans…Louis Armstrong. They married and would write together, play together, and formed a band, The Hot Five, and recorded together. In this lively picture book biography, Rockliff let’s Lil tell her story. Complementing the text are the illustrations of Michele Wood. Rendered in acrylic, the paintings are vibrant and capture the pulse of the music and the times. Back matter includes a timeline, author’s note, and a bibliography of primary and secondary sources. 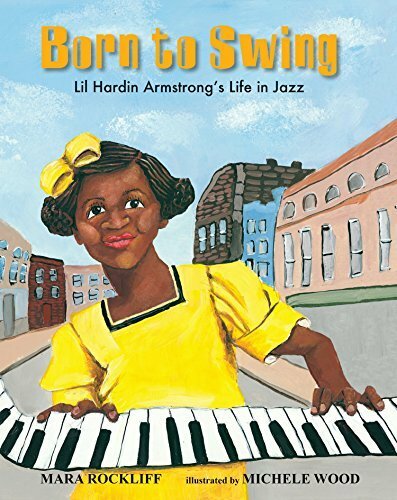 Lil Hardin Armstrong performed in the days of the Big Bands. Duke Ellington and Cab Calloway. "I did it all. I wrote songs, I led bands. Men, women - oh, it made no difference to me, so long as they could swing those tunes." Go here and listen to Lil sing and play the piano. Be sure to play her music whenever you share this book with students of all ages, especially those who play in the school jazz band.